On June 1, 1978, The Splendor of Dresden: 500 Years of Art Collecting opened in the National Gallery of Art in Washington, DC. At the entrance to the massive exhibition, two life-size mannequins on horseback, outfitted in ornate armor, lunged at each other in mid-joust: a preview for visitors of the spectacular onslaught of cultural objects across twenty-two galleries in the brand new East Building beyond (fig. 1). The impact of Splendor was both political and aesthetic. This was the first major loan of art from the German Democratic Republic (GDR) to the United States, initiated immediately after the establishment of diplomatic relations between the two countries just four years earlier. Billed as a grand gesture of cultural exchange in the spirit of the Helsinki Accords, the exhibition was the product of unprecedented collaboration between American and East German museum officials in an environment of intense mutual suspicion at the highest political levels. The gradual erosion of détente in the late 1970s set the stage for a telling opening scene: the dinner planned to celebrate the exhibition’s installation in the National Gallery was deferred to accommodate the NATO summit taking place concurrently in Washington. At the same time that NATO delegates were committing to increase defense spending in response to Soviet military advantage in central Europe, their wives, hosted at a preview tea by First Lady Rosalynn Carter, were among the exhibition’s first visitors. 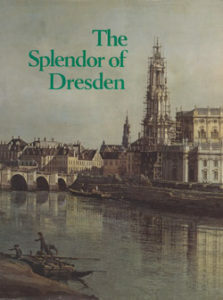 The lavish scope of The Splendor of Dresden was an expression of the firm belief, common to its American and East German organizers, in the utility of fine art to Cold War foreign relations. Splendor joined numerous other exhibition initiatives during the 1970s that exploited the public forum of the art museum as a stage for the performance of mutual understanding on one hand and cultural superiority on the other. As David Caute argues, while the Cold War was a conflict between opposing world powers, it was also a contest over a shared cultural field located broadly in the Renaissance and Enlightenment. An 1823 bust of George Washington included in the gallery on neoclassicism is a case in point. Commissioned from a Dresden sculptor by a Saxon merchant who had served as a volunteer in the Philadelphia militia, the bust was to stand for a liberal republicanism common to Saxon and American cultural traditions in the nineteenth century: “a work of remembrance and respect,” in the words of the exhibition’s principle organizer in Dresden, Joachim Menzhausen. As the catalog noted, the bust was based on an illustration of Antonio Canova’s 1821 statue of Washington for the North Carolina State House. Incidentally, because Canova’s statue had been destroyed when the state house burned in 1831, and had only been replaced with a marble replica in 1970, the Dresden bust served as a unique referent to a work of American cultural heritage since lost. The collections on view in Splendor established Dresden’s artistic wealth in terms that American audiences could easily appreciate; they also sought to prove socialism’s unmatched capacity as a steward of the artifacts of the Western cultural canon. For the East German officials who were largely responsible for Splendor’s conceptual framing, the role of art in political performance was not only the exhibition’s guiding premise but also its central theme. This was among the first exhibitions to focus on the history of collecting, narrating the shifting fortunes of notoriety and prestige won through the production, acquisition, and display of art over five hundred years. In the catalog, published by the Metropolitan Museum but authored entirely by curators from the Dresden museums, this story unfolded according to a Marxist-Leninist narrative, with socialism as the last stage in a long dialectical process of progress and retrenchment. Catering to American audiences, “for whom every communist dialectic is foreign,” this trajectory was both conventional and understated. From the curiosity cabinets of the sixteenth-century electors to the grandiose collections of the absolutist monarchs, through the rationalized public museums of the bourgeoisie, and culminating in the rise of fascism and the total destruction of Dresden’s architectural heritage and near annihilation of its art collections by American and British bombs in February 1945, the socialist state emerged from this history as its logical end and proper keeper. “We recognize the creative conservation of our humanistic cultural heritage in the hands of the working class,” wrote Manfred Bachmann, general director of the State Art Collections of Dresden in his prefatory statement. While the objects on display transformed the splendor of the past into the splendor of the present, they also showed the very concept of splendor itself to be a historical construction: dynamic, contextual, and contingent on the political convictions of their owners. “The Splendor of Dresden” was an astonishingly lavish blockbuster exhibition loan from the German Democratic Republic to the United States between 1978 and 1979. Yet the history of its conception and execution reveals the tensions and ambivalences that underwrote cultural diplomatic efforts in the era of the Helsinki Accords, even those at the grandest scale. ALICE GOFF is a historian of German cultural and intellectual life in the modern period. She is Assistant Professor of History and the College at the University of Chicago.